Fast cooking for apps, snacks, and meals! 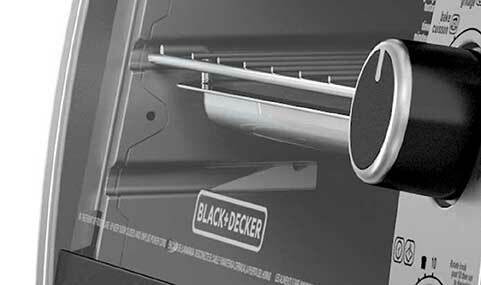 The BLACK+DECKER 6-Slice Convection Oven features enhanced convection technology that circulates hot air to quickly cook all your favorite appetizers, frozen snacks, pizzas, and more. With four cooking functions (bake, broil, toast, and keep warm), and room for a 9" pizza or six slices of bread, this toaster oven makes mealtime easy. Three knobs control the cooking process: the top knob controls the temperature, the middle knob sets the cooking function (bake, broil, toast, keep warm), and the bottom knob acts as the timer for baking and broiling, and lets you select the desired shade for toasting. The included bake pan and broil rack make it easy to cook at both the high and low rack positions for added cooking versatility. 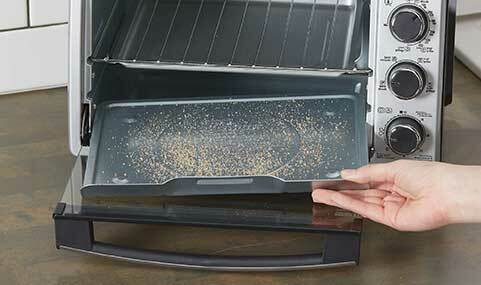 Plus, the removable crumb tray makes for easy cleanup. 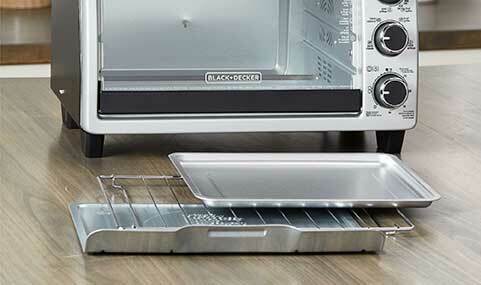 Fast, even cooking with optimized heat circulation within the oven. The 30-minute cooking timer features a stay-on function for longer baking tasks, and a precise toast timer with shade options. 6-Slice Convection Oven, Stainless Steel is rated 3.3 out of 5 by 3. 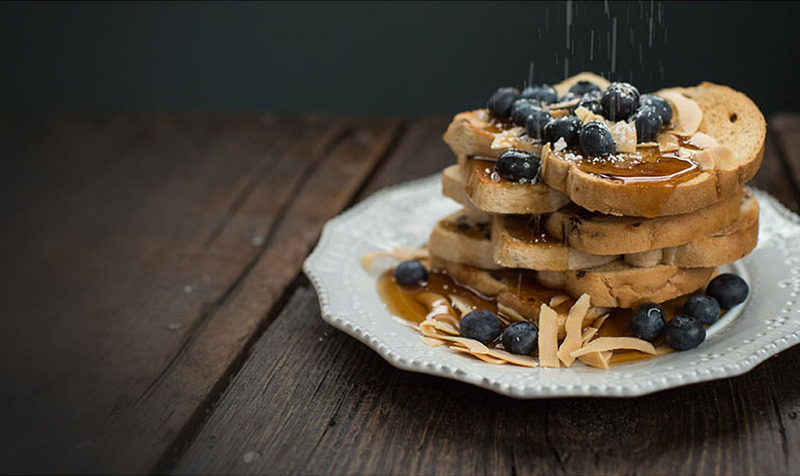 Rated 1 out of 5 by AnaM from Burn Toast Often! This is my second B & D toaster oven. The previous one finally died on us but it lasted about 8 years due to the heating element staying on. Bought this model and have had it for about 3 years but it's going of the fritz! It constantly burns my toast no matter how low my setting is. Also, the heat element stays on after it had been turned off so I have to unplug it from the wall. It's obvious the heating element has gone haywire. I am going to have to purchase another but not sure about B & D's quality after this. Rated 5 out of 5 by Kimmie1987 from Great everything I received this appliance for Christmas from my hunny, it is amazing I baked cookies that cooked quick and evenly I can't wait to bake dinners in this. It will be a great addition to our camping trips also. Rated 4 out of 5 by Bozz from Does a great job. I bought this several months ago to replace a Black and Decker toast oven that isn't available any more...it slide into a rack under the cupboards. Lasted for years. I have cooked chicken and potatoes and pork chops in this one. I like how it toasts. The knobs are a bit confusing at first and you have to be careful taking the crumb tray out but basically I am very happy with it so far. Is there an option NOT to bake with convection? It sounds like it automatically comes on when you choose bake and set the temperature. I have always had an option. No manual which is annoying. Thank you for your question. The convection fan turns on automatically when the oven is set to bake. 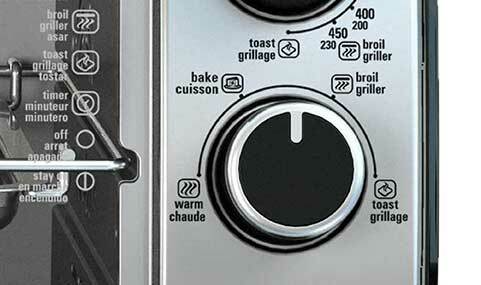 Does the stainless steel 6 slice convection toaster oven have a non-stick interior? Also if it is non-stick is the non-stick material contain PFC? Is there a cookbook or list of recipes that can be used for this toaster oven? What is the difference between the warm and broil function? They seam to use the upper element and pull the same wattage. What is the total height of the unit, from the counter top to the top of the oven?